Three $10 gift cards. Perfect for movie lovers. Use at any AMC Theatres, AMC Loews, AMC Showplace, Cineplex Odeon, Magic Johnson and Star theatres in the U.S. 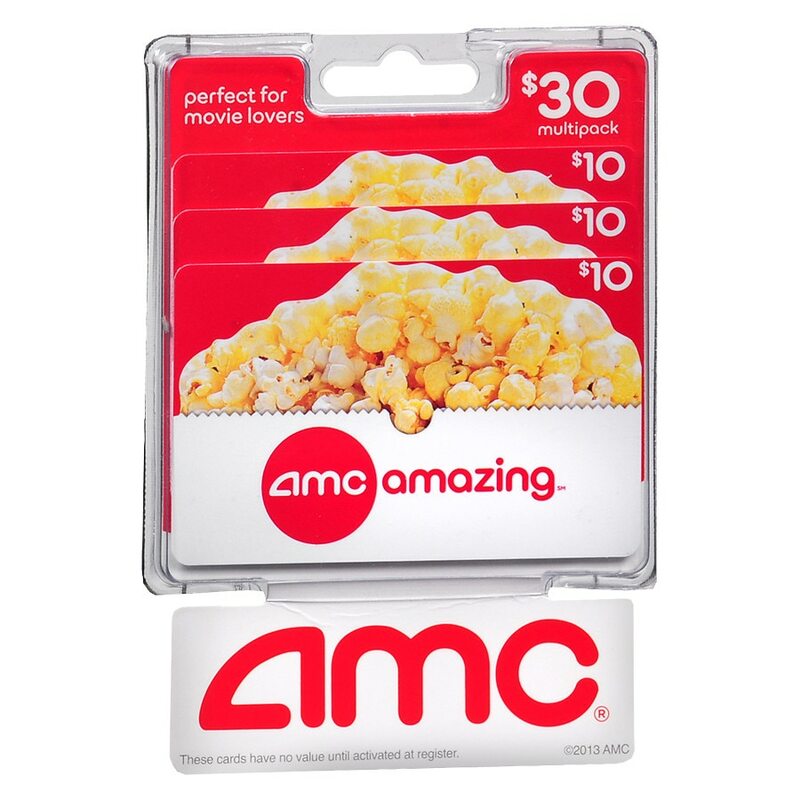 Usable up to balance only to buy goods or services at any AMC Theatres, AMC Loews, AMC Showplace, Cineplex Odeon, Magic Johnson and Star theatres in the U.S. Not usable to purchase gift cards. Not redeemable for cash unless required by law. Not a credit or debit card. Safeguard the card. It will not be replaced or replenished if used without authorization. If lost or stolen, replacement card with remaining value requires original proof of purchase. AMC Card Processing Services, Inc. ("AMC CPS, Inc") is the card issuer and sole obligor to card owner. AMC CPS, Inc. may delegate its issuer obligations to an assignee, without recourse. If delegated, the assignee, and not AMC CPS, Inc., will be sole obligator to card owner. Purchase, use or acceptance of card constitutes acceptance of these terms. For balance or other customer service inquires, visit any AMC theatre, log on to website listed on the back of the card or call 1.800.255.0311..